The temperatures have finally crept up past single digits in the last week or so (touch wood) – I think Spring may actually be upon us now! This means one thing – COLOUR. And lots of it! 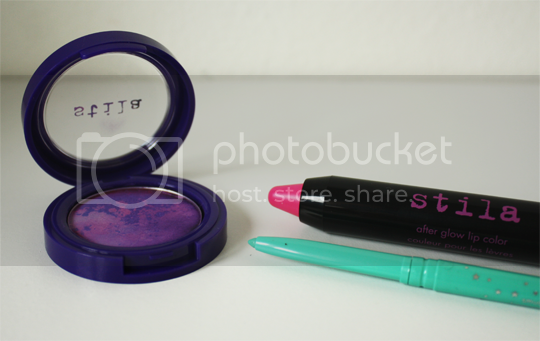 Stila’s Summer 2013 collection, Stila Festival of Colour, is the perfect antidote to our recent weather-based misery with tie-dye eyeshadows, UV responsive lip colours and bright turquoise eyeliner. Count me in! Stila Festival of Colour is very much inspired by the Seventies, all very hippie chic, and the products are definitely essentials for those who spend their summer touring the country for music festivals! I’m feeling a bit backwards today, so let’s start from the lips upwards. The collection features six After Glow Lip Colours, in the infinitely popular twist-up crayon format made famous by Clinique Chubby Sticks. All of the colours are bright, perfect for a statement Summer pout, with an added twist – they’re blacklight responsive! If you’re a bit of a clubber or a raver, you’ll love these. Swatched above is Electric Pink* (£12) – I wish I had the facilities to show you how it looks under UV light – I have seen it and it’s seriously cool. The colour is quite pigmented, and very builable – the swatch above is just one layer but you can really amp it up if you’re not afraid to wear a bright lip. It feels lovely on too – sunflower seed oil and Vitamins C & E offer good moisturisation but do impact on wear time. It leaves a stain of colour, but the full impact doesn’t last that long, particularly if eating or drinking. Hnnnngghhh! How frigging beautiful is this?! 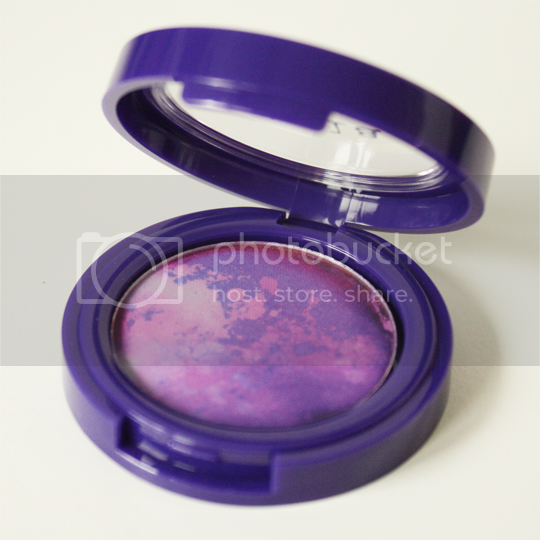 This is the Countless Colour Pigment in the shade Melody* (£14). These tie-dye inspired beauties aren’t actually ruined by an awesome overlay with disappointment below the top layer of colour, which I have to admit I was expecting. Each coloured section runs right through the eyeshadow which I think is really cool. These little works of art come in 10 different shades – I’m really lusting after Centre Stage (fourth from the left) – the colours match my favourite shirt! I haven’t yet worn this one on the eyes as I just haven’t felt in the mood for purples, but if you have brown eyes this would look stunning on you. 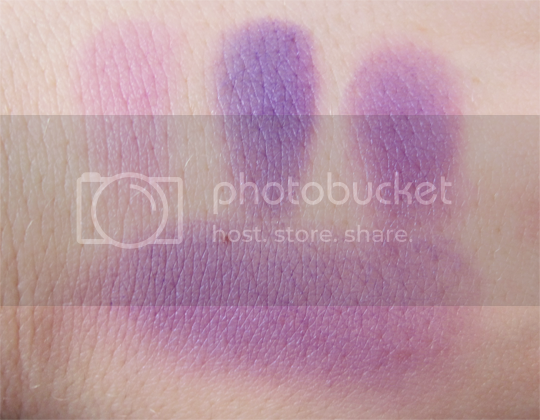 The pigment is moderate, but again definitely buildable. I would definitely recommend picking up one of these just because they’re so unique and pretty to look at! 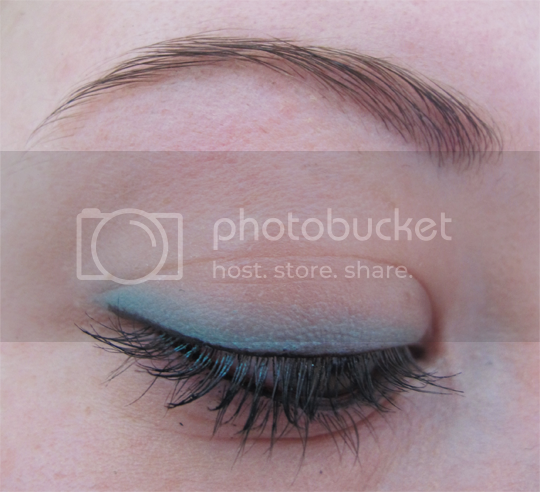 And now we come to my personal favourite – the Smudge Stick in Turqouise* (£13). 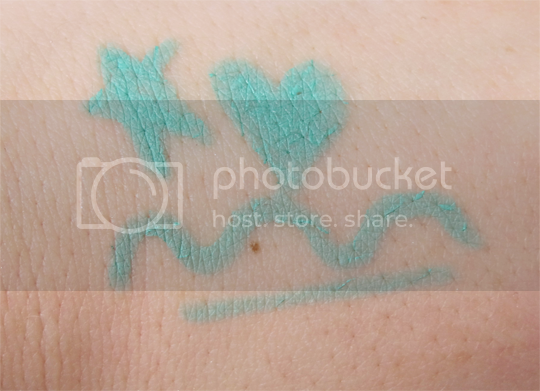 I am already a big fan of Stila Smudge Sticks but all the shades I have already are shimmery jewel tones, more suited to an Autumn/Winter look so I’m very excited to have added this bright, bold matte shade to my collection for Summer – this new Turquoise shade will also be available in Stila’s best-selling Stay All Day Liquid Eyeliner formula. I haven’t tried the liquids so can’t comment there, but I literally don’t have anything bad to say about Smudge Sticks, they’re honestly perfect – they show up in the waterline, they are smudgeable as the name would suggest but only for about 30 seconds after which they will. not. budge. They’re entirely waterproof, so whilst this does mean you need a good makeup remover to get them off (good ol’ Bioderma can cut through it no problem) it also means they’re an excellent choice for Summer makeup – no chance of sweating it off while you dance away at a festival or if you’re taking a dip in the pool. Honestly can’t recommend Smudge Sticks enough! I’ve been wearing this one quite a lot on its own, no eyeshadow – just smudged along the upper lashline and finished with a thin line of black to enhance the lashes for a welcome pop of colour in a fuss-free ready-in-minutes look. Also included in the Stila Festival of Colour collection are two Lip Glaze Trios, and two HD Beauty Balms – one for bronzing and one for illuminating. What’s catching your eye the most? Are you feeling Stila Festival of Colour as an ideal way to perk up your look for the warmer months? I’m afraid I’m not 100% sure of the UK release date yet, but I’ll update this post when I find out! I’m so excited for this collection! Any idea when it’s released in the UK? Aaaa, everything looks awesome! The tie dye eyeshadows are so pretty, I’d want to frame them instead of use them! That colour pigment is so pretty!